There were two upgrades for road models during the life of the 24x motor. In 1976 the pan was deepened slightly, and in 1981 the pan was deepened substantially and redesigned to include a baffle plate. Dipsticks were lengthened correspondingly, although the cutoff points for them are nowhere near being clear or consistent. The enduro models retained the shallow oil pan (with threaded bosses for a bash plate), although this was deepened slightly in 1991. Note: Enduro models for this purpose include not only the G/S and GS, but also the Roadster and Mystik since they had the same configuration. These are the original combinations which work together properly. 11 41 1 265 590 extension for use with 223 head, for /7. 10mm aluminum. 28mm bolts. These used a 1/2" deeper pan with the drain hole in the rear wall, possibly to work better with the PD bash plate. The dipstick has the same length and MIN marking as the earlier GS one, but the MAX mark is lower. A baffle was added inside a new, shorter cast pickup head. Early pans were shallow with no baffle. These used a simple metal pickup head. In 1976 they were deepened, and a 10mm spacer was used to lower the pickup head. Dipsticks were lengthened correspondingly. In 1981 they got slightly deeper still, with a baffle at the front to keep oil close to the pickup head during moments of brief deceleration. This design used an all-new one-piece cast aluminum pickup. Same dipstick as before, but now with a plastic handle. The G/S and GS (along with the R and Mystic) always had shallow oil pans. 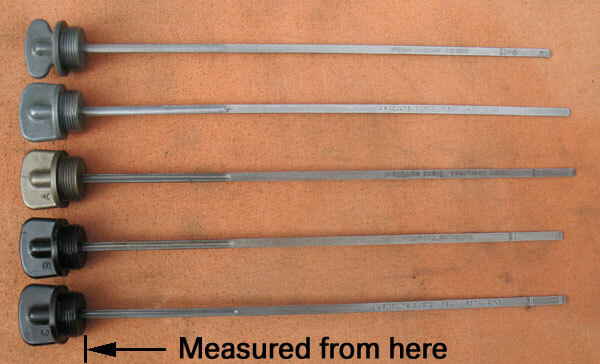 80-90 models were dimensionally identical to the /5 (except they had threaded holes to mount a bash plate), while '91-'95 models had a 1/2" deeper, smooth-bottom pan with a lower MAX mark on the dipstick. The shallow pan with the threaded holes is now the replacement for the /5. 66mm 48mm 1650ml '81-'95 (not enduro), rearward-facing drain. 295 pan, cast in May 1978, from a '79 R65. Cast with part number 1 251 294. This was superseded by the 330 pan (with holes for the bash plate). 723 pan, cast in September 1976, from a '77 R100S. Cast with part number 1 262 722. 995 pan, cast in April 1983, from an R65. Cast with part number 1 336 994. 620 pan, cast in 1991, from an R100R. Cast with part number 1 338 627. Dipsticks had plastic handles after 1980, with the letters A, B, or C molded in. The equivalent plastic-handle version is the current replacement for earlier metal ones. 247 274 277 Metal handle, from /5. Superseded by "B". 255 282 287 Metal handle, '76 and '77 models. Superseded by "A". 260 282 287 Metal handle, from '78. Superseded by "A". 263 284 288 "A" plastic handle, from '84 R65. 247 273 277 "B" plastic handle, from '88 GS. 256 274 278 "C" plastic handle, from '91 GS. Like B, but MAX is lower. There are three different pickup heads. All of them are sloped to match the slight wedge shape of the oil pan. Heights are measured from the center of the oil feed hole down to the bottom of the pickup. The steel type was used starting with the /5, and was extended with the 10mm spacer when the pan got deeper in '76. The original spacer was 12mm, made of phenolic resin. This can compresss with age, causing the bolts to loosen. The 10mm metal spacer is an update. 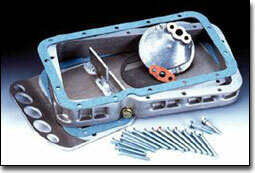 The cast pickup head was introduced with the deep oil pan in '81, and was 44mm deep. When the oil pan for the GS and R was changed in 1991, a shorter (33mm) version of this pickup was used, along with an internal baffle plate with the opening to the front of the bike. 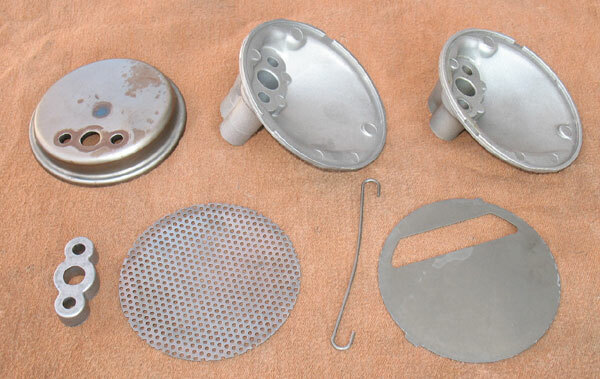 Clockwise from top left: steel pickup, 44mm cast pickup, 33mm cast pickup, baffle for 33mm pickup, wire bail and screen (used on all), spacer for steel pickup. 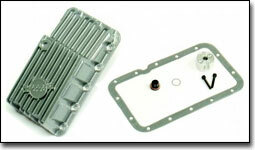 The early enduro oil pan takes the flat "waffle" bash plate 51 47 1 242 295 or the wraparound bash plate 71 60 2 315 345. Both have cutouts in the rear to accomodate the downward-facing oil drain hole. This combination was specified for both the G/S and early GS bikes. The later '91-on oil pan takes the same waffle plate or the wraparound bash plate 71 60 2 315 651, which does not have (or need) the rear cutout for the drain plug. The hole pattern is the same for all of them, and both wraparound plates have recessed mounting bolts. The deep pan and cast pickup are better than the earlier designs, so you can get more reliable oil delivery using the newest parts. Additionally, the greater air volume in the sump means less fluctuation in crankcase pressure and therefore less oil lost through the breather. If you're looking to upgrade a shallow-pan bike, use the parts that were on the 1995 RT if the centerstand will clear. The original centerstand on the '70~'75 bikes won't clear the deeper sump; you need to replace it with the '76~'80 centerstand (which is all that's available now). The difference is visually apparent; on the new stand the upper crossbar is halfway between the mounting holes and the lower crossbar, whereas on the old stand it's noticeably closer to the mounting holes. If you're looking to upgrade your early GS, buy the parts that were on the 1995 GS (provided you want to stay with the shallow sump at all). The aftermarket provided several deeper oil pans, especially during the '70s before BMW had a good deep pan of their own. 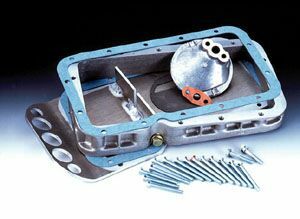 Most well known is probably the Luftmeister 3-hole sump extension. I'll get a picture of one when I can. Still made, by MAC which is better known for exhaust systems, is this pan (left) with a step to clear the centerstand brace. HPN makes this two-part oil pan which uses a flat bottom plate (left) and this forms the engine's 'bash plate' with nothing else required. It's very strong and is used on every rally bike engine. 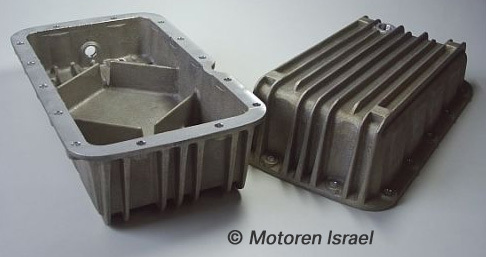 Motoren-Israel and Siebenrock spacers looking like the HPN sump, but whereas the HPN version is sloped to match the shape of the pickup head, the Siebenrock and MI versions appear to be simple spacers, the same thickness from front to back, which are used with your existing oil pan. A spacer is provided to lower the pickup head to match the new sump bottom. 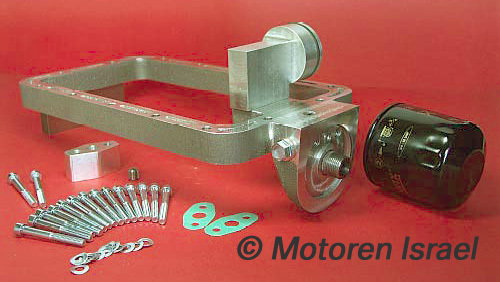 Motoren-Israel makes a custom sump extension (top right) which replaces the oil filter canister with a fitting for an external spin-on filter. It's available in standard (shown here) and lightweight, which has machined pockets in the sides. They also sell a deep sump and this very distinctive long sump.